The mountain's inches have now out-inched last season. As of Jan. 20, 2016, Mammoth Mountain had breezed past last season's total snowfall. MUCH OF A WINTER'S WEEKEND... is about watching and waiting. You're waiting for the snow to start falling, before you make your next cup of tea inside your cabin. You're waiting for the snow to stop falling, briefly, so you can take a short walk, to enjoy the crisp air. You're waiting for your friend to get to the bottom of the slope, or catch the lift to the top, and you're waiting for the embers in the fireplace to die down, so everyone can turn in and get in early start. As for people up at Mammoth Mountain over the course of January 2016? Much of the waiting has been about a single marker: When the snowfall for the 2015-2016 season would top the season before. The general expectation was that such a milestone would arrive on the early side, well before the springtime wrap-up at the schuss-tastic spot, and the general expectation was met: On Wednesday, Jan. 20 the snowfall measurement surpassed last season, which was notably on the unsnowfall-esque side. SO WHAT'S THAT IN INCHES? 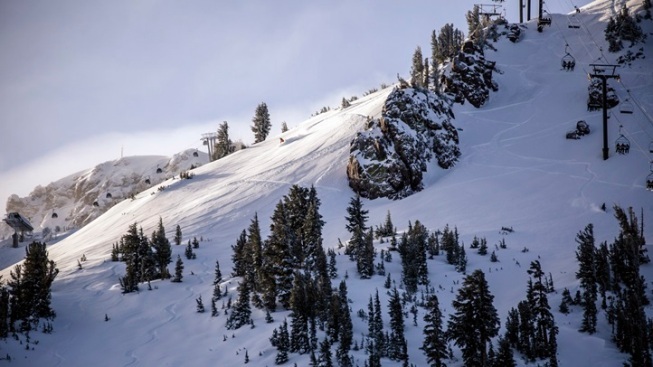 The total accumulation at the Sierra resort for the 2014-2015 season was 176 inches. Jan. 20 saw the inches top out at 188, thanks to a series of dumpable, flake-heavy storms. "That puts us squarely on track for our best year since the record setting 2010-2011 season that saw a season total of 668.5." Whoa, that's some snow, and the Jan. 23-24 weekend looks to deliver more. But just because the sky'll be way active doesn't mean that activity'll come to a halt on the ground; freeskiers and snowboarders are on the mountain for the 2016 U.S. Grand Prix, and kid-nice haps like Woolly's Saturday Parade are still trucking. There's no watching and waiting, in short, even with a lot of snow swirling; fans who've been waiting for a bonanza snow season are getting it, and they're getting outside. So what will the total be by the end of spring? Surely someone somewhere on the mountain has a guessing jar going.